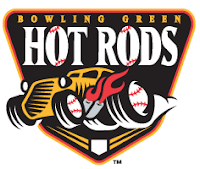 The Bowling Green Hot Rods went 3-2 on the week and concluded the first half of the season with a record resulting in a place finish. The league finished the week with the annual all-star game in which three Hot Rods made the roster. Chris Murrill made the start in right field and went 1 for 2 on the night. Alex Colome pitched an inning, allowing no hits with 1 strikeout. Wilking Rodriguez also had a no hit appearance, pitching 2/3 of an innings and also recording a strikeout. Transactions: Mayobanex Acosta transferred to Hudson Valley (6/22/10). The Week Ahead: 6/23/10-6/24/10: Day Off. 6/25/10-6/27/10: at Fort Wayne Tin Caps (0-0). 6/28/10-6/29/10: vs Lansing Lugnuts (0-0).